I loved Finn even before I saw him. 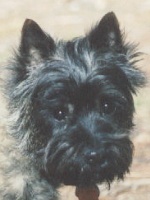 We had arranged to meet Carol, a Cairn exhibitor and breeder, in a nearby parking lot. We had been to her house, talked with her about lots of things, but we hadn’t actually seen this litter yet. She got out of her van and walked around to the side. Carol opened the door, reached in, and brought out an adult Cairn on a lead. “This is the pup's mother,” she said. I want a dog that looks like that, I said to myself. The mother was smart-looking, in both meanings of the word: her intelligence was obvious as she looked around, and her show–groomed coat made her sharp. “And this is the pup,” Carol said as she lifted out a much smaller and fluffier version of the mother. I want that dog, I whispered to Becky. Carol agreed to bring the dogs to our house, which was close by. Carol’s aunt was with her, so soon Carol, her aunt, and the two Cairns were in our kitchen. We had a child gate up in the door to the dining room, and our two elderly Shih Tzus watched cautiously from behind. I put the pup on a lead and took him into the back yard. “He’ll just sit there, or fight you,” Carol said, “he’s never been on a lead.” Instead he walked around with me for a few minutes, then we went back in. Carol had been telling Becky about what it takes to raise a Cairn, especially how rowdy they can be and how much trouble they can get into. After a good deal more interviewing, Carol agreed to sell us the pup. We found out some time later that as they left, Carol’s aunt told her that “those people didn’t listen to a word you said. That dog is going to kill them.” She was very nearly right, of course, but that’s another story. But ... you've given your heart to a dog to tear. And will give your heart to a dog to tear! A short-term loan is as bad as a long. 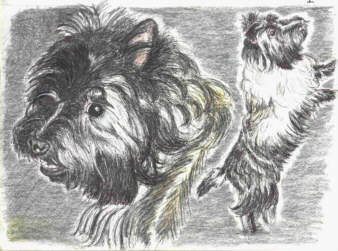 From The Lost History of the Canine Race, by Mary Elizabeth Thurston, Andrews and McMeel Pub., Kansas City, 1996. 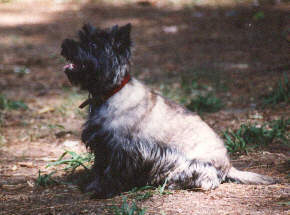 Finnegan passed away on the 27th of August 1999. We cannot express how much he is missed. 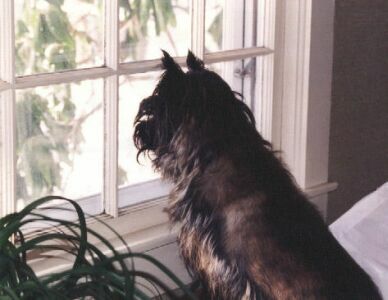 The Terrier Tribe can also be reached at info@TerrierTribe.com.